Our products are processed within hours of harvest, thereby maintaining their ‘just picked’ freshness. The location in the horticultural belt of South India enables farm fresh produce to be received in the factory within hours of harvest. This results in a higher quality of the finished product since the ‘just picked’ freshness is retained on arrival at the factory. Importantly, the company is able to process a wide variety of fruits and vegetables. In addition, proximity of the plant to the Chennai Port, an all weather port with excellent facilities, makes it very convenient to send shipments all over the world. The team at IQF Foods Pvt Ltd. understands the importance of food safety. There is constant monitoring at every stage in the manufacturing process - from its arrival at the factory to its dispatch in refrigerated containers. This is considered vital. The in-house Laboratory is manned by skilled personnel who constantly oversee the manufacturing process as well as the characteristics of the final product. 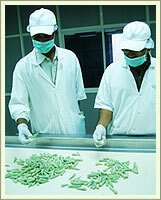 Good Manufacturing Practices (GMP) are established and are strictly practiced during the manufacturing process. in addition , employee feedback on individual process helps improve the system constantly. We encourage customer quality team audits and are quick to respond. The Individually Quick Freezing technology is one of the most effective of preserving the natural characteristics of the products. They have a shelf life of two years stored at -18°C. No preservatives or any artificial substances are added to enhance the characteristics of the products offered, thereby maintaining their natural freshness.